When @JLgoesVegan came to Chicago yesterday and asked if anyone wanted to go to dinner at Karyn’s on Green, I jumped at the chance. See, I have a hubby who doesn’t like to eat out and so I don’t really go anywhere. 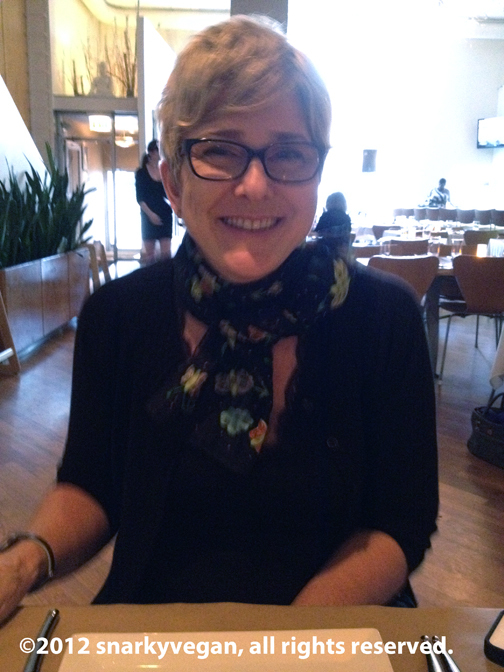 Let alone to a swanky vegan joint like Karyn’s. Now, I’ve been to Karyn’s Cooked (Green is way better IMHO), and I’ve gotten take out from her raw cafe (I like Cousin’s better) but I LOVE Karyn’s on Green. 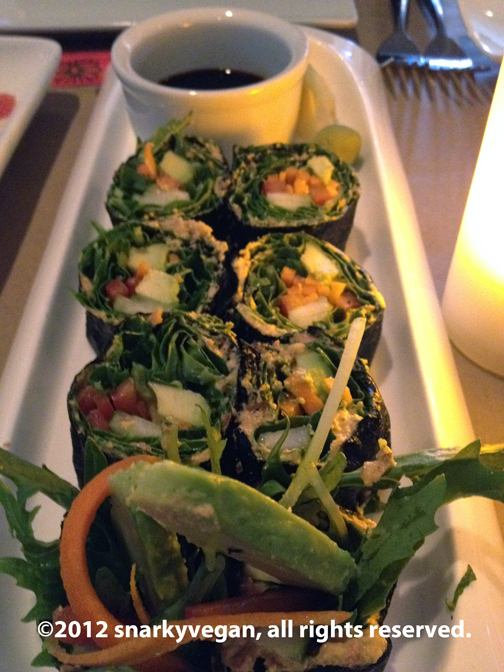 The Maki Roll: really swell but if you’re a sushi snob, it’s a rather loose roll. Be careful on the way to your lips. 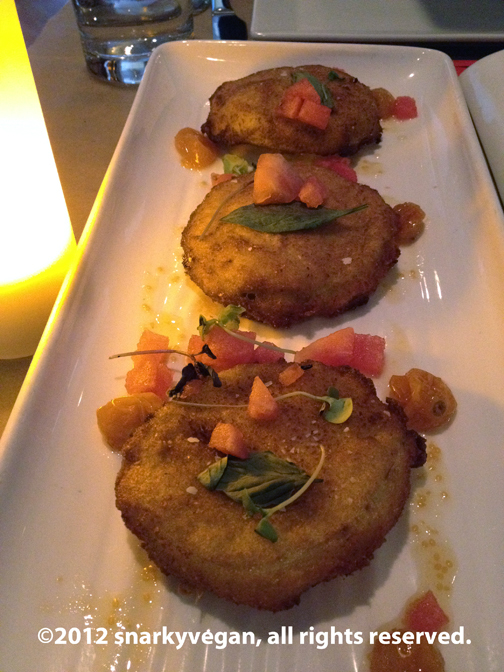 Fried Green Tomatoes: As JL put it, “the crust was healthier than I expected.” This ain’t yer grannie’s fried green maters, nope. They are indeed fried but the crust is not crumbly and it does stick well to the tomatoes. You won’t need a spoon. Oh, and those little golden gooseberries, snag those! They’re awesome! 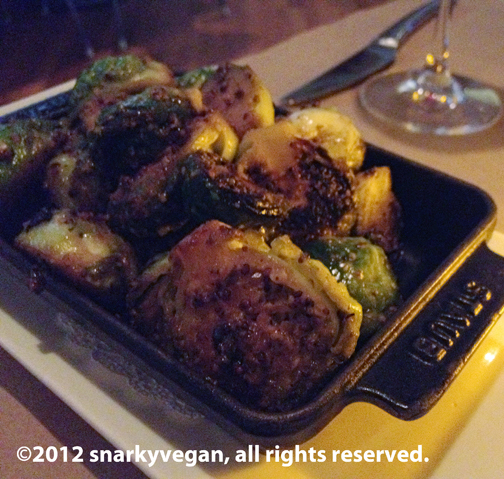 Caramelized Brussels Sprouts: I guess Karyn is known for these and they do not disappoint. Between JL’s BBQ seitan and these, it was hard to pick a favorite. Hush Puppies with Coconut Aioli (cup in upper left corner of photo): OMG! 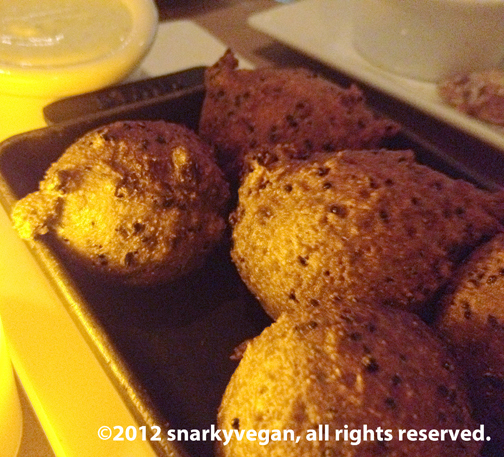 While the red quinoa hush puppies were yummy, the aioli was nothing short of amazing. Don’t let the mention of coconut scare you, it does not tasty “coconutty” not to me anyway. Karyn should really bottle this stuff. I wanted to put it on everything. 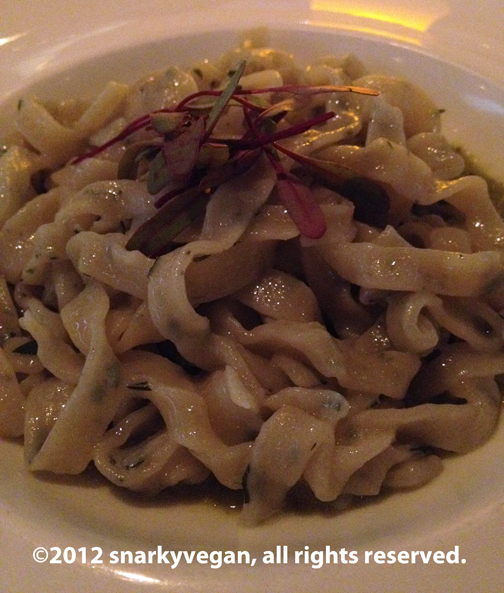 Coconut Tarragon Tagliatelle (homemade pasta with green tomato marinara): This was the only dud of the whole dinner. I was really hoping for a yummy pasta but was sorely disappointed. The portion was dinky and the taste…below meh. It just didn’t compare to the complexity of the other dishes. 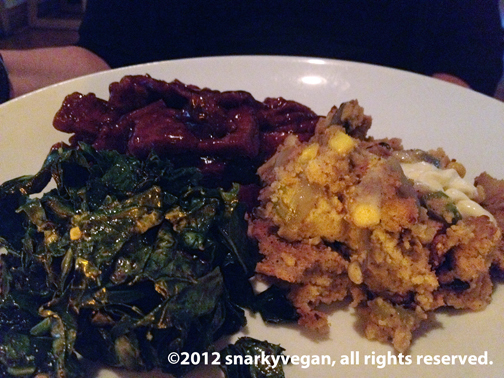 Barbeque Seitan with cornbread stuffing and braised collards: This was a really great dish. It was JLs and she’s a nice gal so I couldn’t exactly steal it from her. But she was kind enough to let me take the leftovers. The BBQ sauce was among the best, the toothiness of the seitan was perfect, and the stuffing was really really yummy. So much vegan stuffing doesn’t clump and stuffing isn’t stuffing unless it clumps, y’kno? Nice and savory all ’round. Great comfort food. I felt like the collards were there for vitamins though. Or maybe I just prefer my own collards? If I’m ever in Chicago, I’ll get in touch. I’ve been wanting to try Karyn’s on Green. Nice recap! I’m so glad we got to see one another, get caught up, and FEAST! All of this food looks amazing! I’m slightly jealous — even though I’ve only been there once, KOG made a great impression and is easily one of my favorite restaurants. We’ll be outside of Chicago for two days in November, and I’m hoping we can sneak in a quick bite to eat at Karyn’s before we return home. The barbeque seitan with cornbread stuffing and braised collards sounds particularly appealing, especially since we will be nearing Thanksgiving.